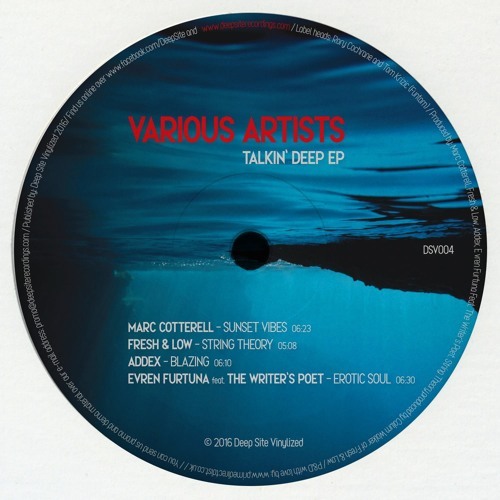 Artists: Various Artists Title: Talkin' Deep EP Label: Deep Site Vinylized Release Date: 5th September 2016 (vinyl) Croatian record label Deep Site Recordings recently released a physical version of a brilliant deep house EP featuring Marc Cotterell (who released an exclusive mixtape for us in December 2015), Fresh & Low, Addex and Evren Furtuna ft. The Writers Poet. The whole recipe is perfect to open a gig or close it while the sun is rising. Especially with the song from Addex "Blazing" we are premiering below. Check out this digital exclusivity and feel free to show some love.